After ten days in Papua New Guinea spending time with some amazing women who live and work with the local people there, I came home to my family ready to do one of the things I most love, cooking something delicious for them. 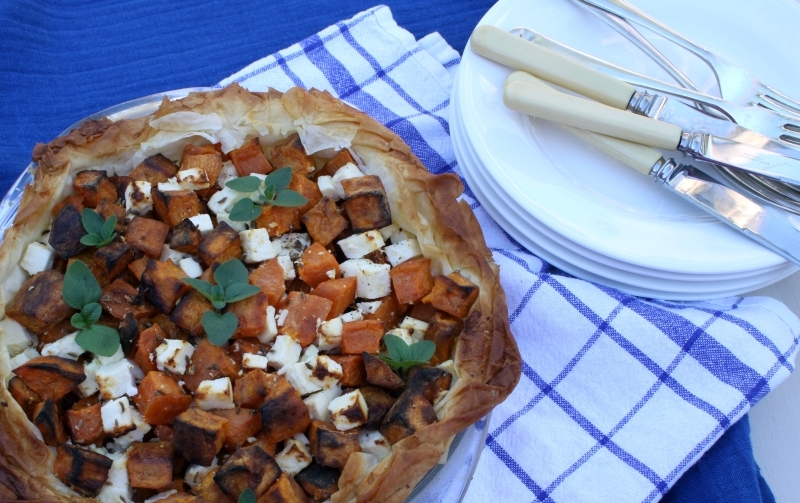 Sweet potato is common in PNG so I was inspired to make this sweet potato and feta pie. Lightly spiced with cumin seeds, it’s a simple lunch or light dinner dish and uses the easiest of all pastries – filo – as the base. We enjoyed the pie with a green salad and a Friday night movie (Star Trek, the newest version). Bliss! Preheat oven to 180C. Toss the sweet potato in the olive oil so that all the pieces are lightly coated. Roast the sweet potato in a single layer on an oven tray lined with silicon paper until tender and lightly golden. In a medium sized bowl combine the roasted sweet potato, cumin seeds and feta cheese and season well with salt and pepper. Brush the inside of a 20cm in diameter pie dish with a little of the melted butter. Working quickly, brush each layer of filo pastry with the melted butter and line the pie dish. It doesn’t matter if the edges are a little rough – it’s meant to be rustic looking. 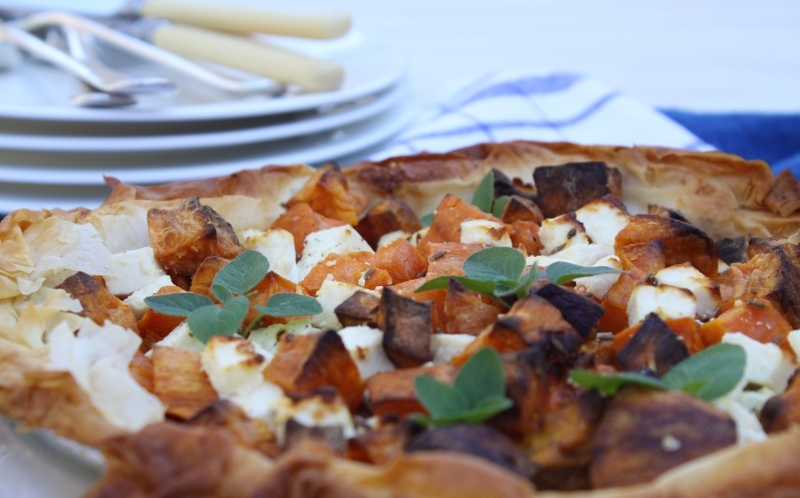 Spoon in the sweet potato and feta mixture and then return to the oven for 15 minutes, until the pastry is brown and crispy. Serve hot or warm, with the oregano scattered over the top of the pie. Yum! Looks so delicious and complex, but I l like how simple the recipe actually is. Thanks for sharing!